The Samsung Galaxy Note uses the standard TouchWiz music player, which is pretty good news as we cannot think of a feature that it lacks. But for the automatically generated album art that we saw on the N9, it does everything you’d expect of it. The video player lets you choose between three crop modes for how the video fits the screen. There’s 5.1 channel virtualization and subtitle support. You can change font size and adjust subtitles sync (move them back or forward a few seconds) but there’s no option to manually load subtitles, they have to have the same filename as the video file to load. The video player had absolutely no trouble with any of the files we threw at it – starting with .WMV, through .AVI (DivX and XviD) and .MP4 to .MKV (H.264). Resolution wasn’t a problem either – the Samsung Galaxy Note played FullHD files with ease. Large files of over 2GB worked as well. The even better news is that the battery support won’t let you down either. We found the Galaxy Note capable of 8:25 hours of continuous video playback on a single charge, which should suffice for just about every scenario. The Samsung Galaxy Note is equipped with an FM radio with RDS. The interface is simple – there’s a tuning dial and you can save 6 stations as favorites. You can also listen on the loudspeaker, but the headset is still needed to serve as an antenna. 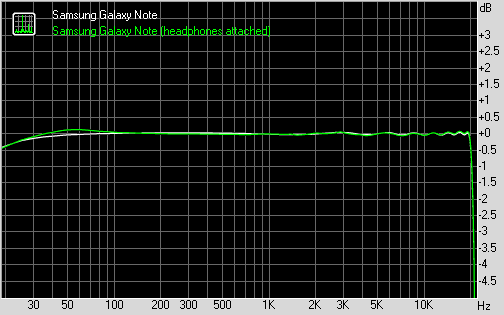 Unsurprisingly, the Samsung Galaxy Note passed our audio quality test with flying colors. It couldn't beat the Samsung Galaxy Tab 10.1, but it did better than every other Samsung device we have tested. As you can see there's nothing to frown at when the Galaxy Note is connected to an active external amplifier. We were somewhat surprised by the low volume levels, but the output couldn't be any cleaner. We were also pleased to find out that there is only slight deterioration when headphones are attached. The stereo crosstalk reading took the biggest hit, but the intermodulation distortion and frequency response stayed very good earing an excellent mark overall.